If you’re unfortunate enough to break your ankle you’ll be unable to walk properly and may be completely immobilized. If you do suffer from a break there are various ways that doctors will treat the injury. You may have to visit an emergency room to have a plaster cast fitted but using an ankle brace is also an option. Ankle braces are an inexpensive way to support and protect a broken ankle until it has healed. An ankle brace won’t fix the break overnight but it’ll help your recovery and wearing one may alleviate some pain. Many doctors now prefer to prescribe ankle braces when patients have suffered a break. A clinical study has shown that using an ankle brace to treat a broken ankle has some benefits. Plastic with reinforced steel supports. Who Needs to Use an Ankle Brace After a Broken Ankle? When you’ve broken your ankle you may have to wear a plaster cast until the break has healed. When the cast has been removed you can wear an ankle brace to give some support to the weakened ankle. Protecting and supporting the joint is necessary until the injury has healed. 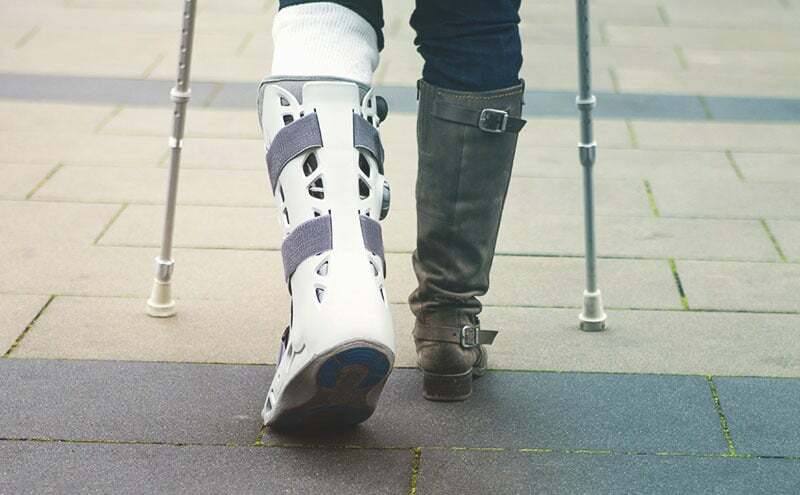 In some cases you may not have to have a plaster cast fitted when you’ve broken your ankle and a brace can be used instead. Some minor breaks will just need to be stabilized and protected while they heal. A decent ankle brace will support the ankle without having to wear a cumbersome cast. You can also benefit from wearing an ankle brace when the break has fully healed. Wearing a sleeve or lace up brace will support the ankle which can help to prevent further breaks. If you plan to play sports or go for a run then wearing a sleeve-style brace is a good option. How Does an Ankle Brace Work? Ankle braces are designed to support and protect the ankle following a break until the injury has healed. It’s necessary to keep the ankle in the correct position whilst the bones knit together. If the bones move around they won’t knit and the break will take much longer to heal. Some of the ankle braces also provide some graduated compression which aids the healing process. Graduated compression improves the flow of blood and lymph fluid which helps to heal damaged tissue. Compression also helps to control swelling which often occurs after an ankle has been broken. There are three types of ankle brace that can be used to support and protect the ankle following a break. The ankle braces are either sleeves, lace-up braces or boot-style braces. A sleeve style ankle brace is an open-toe sock that slips over the foot to fit around the ankle. The sleeves help to support the ankle and they also provide graduated compression to encourage blood flow. It’s worth noting that although these braces provide some support they offer very little protection for the ankle. Lace-up ankle braces are similar to a shoe and when tightened they offer a good level of support for the ankle. Some of the lace-up braces contain reinforced stays to stabilize the ankle. These lace-up braces allow for some movement and also provide some protection for the ankle. Boot-style ankle braces provide maximum support, stability and protection and they also immobilize the ankle. The boots are made from rigid plastics and are lined with soft padding for comfort. Some of the boots also contain air chambers that can be inflated to mould to the ankle. How Do I Choose an Ankle Brace After a Broken Ankle? One of the most important things to do is make sure you buy an ankle brace that’s going to fit well. The ankle brace needs to be a snug fit so that it supports your ankle whilst you’re recovering. If the brace is too big it won’t support your ankle and you won’t be getting the support and protection needed. Look for an ankle brace that’s breathable so it’s comfortable and cool to wear. When you have an ankle brace on for long periods you’re going to perspire and a breathable brace is a good option. If you sweat too much whilst wearing your ankle brace you could develop rashes or other skin conditions. Choose an ankle brace that’s easy to put on, take off and fasten without any help. Velcro-fastening braces and sleeves are the easiest to fasten and adjust. If you choose a lace-up brace they can be a little tricky to fasten and tighten. 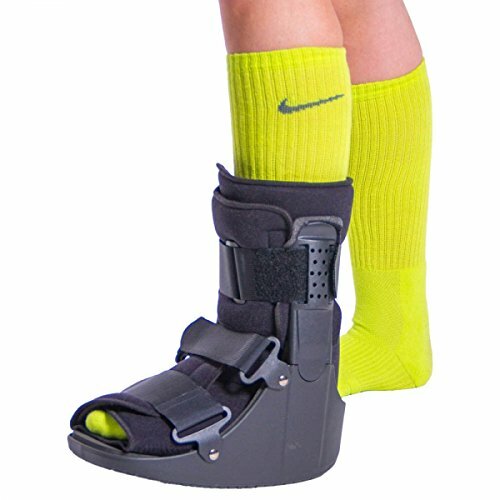 If you choose a boot-style brace so that you can walk around in it you should buy one that has some grip. Many of the boot-style ankle braces have a textured tread on the bottom to prevent wearers from slipping. A boot without any grip may be unsafe and if you slip you could damage your ankle or suffer other injuries. Buy an ankle brace that’s easy to keep clean by hand washing or machine washing. Many of the sleeve braces can be washed and the boot-style braces can be cleaned with warm soapy water. Keeping your ankle brace clean will keep it in good condition and odor free. Buy an ankle brace that fits properly. Choose a brace that’s breathable. Buy a brace that’s easy to keep clean. What Is the Best Ankle Brace After a Broken Ankle? We’ve looked at a number of ankle braces that can be used by people to help them to recover from a broken ankle. We looked at the design of each brace, price, quality and the support provided. We’ve reviewed five ankle braces and we’ve highlighted some pros and cons for each one. This brace made by United Surgical is a boot-style brace available in five sizes and is suitable for people who’ve suffered from a broken ankle. The lightweight boot has plastic moulded uprights with steel reinforcement to provide some extra support. A great feature on this brace is there are chambers that can be inflated for comfort and support. People who used this ankle brace said that it’s comfortable to wear and they can also walk around with it on. Customers also liked the fact that the ankle brace is easy to put on, take off and adjust. Customers who were recovering from a broken ankle said the brace provided the support that was needed. Customers who purchased this boot said the built-in pump that inflates the air chambers had failed after a few days. People also said that the boot is a little too heavy and cumbersome. A few people reported that the Velcro straps on the brace had failed after a few days and they could no longer use the boot. The BraceAbility short broken toe boot is suitable for treating foot and ankle injuries and is available in five sizes. The boot is made from strong polymer to support and protect the ankle following a break. The boot is lined with a soft foam for comfort and it’s secured with heavy duty Velcro fastening straps. Customers who used this ankle brace said that it’s easy to put on and comfortable to wear throughout the day. People said that the brace supported and protected their ankle well following an injury. Customers also reported that the boot’s durable and didn’t show any signs of wear after being used for many weeks. Customers who used this boot-style brace said that they couldn’t get it tight enough to provide the support they needed. A few customers said that the boot is too heavy and they couldn’t walk in it. Other people were also disappointed with the quality of this brace for the price paid. The Venom ankle brace is a lace-up support and compression sleeve and it’s available in small, medium and large. The ankle brace is made from breathable neoprene and as well as the laces there are two adjustable straps. The brace is lightweight and is suitable for protecting the ankle following breaks, sprains and other injuries. A number of customers who used this ankle brace like the fact that they can wear it underneath their regular footwear. Customers said that the ankle brace is easy to adjust and it provides a good level of compression. A few customers said that this brace supports their ankle but still allows for some movement. Other customers who purchased this ankle brace said that it didn’t provide the support that they needed. People also said that the lace holes have no rivets and they noticed wear after a few weeks of use. A few customers said they had difficulty putting the ankle brace on and couldn’t get a comfortable fit. 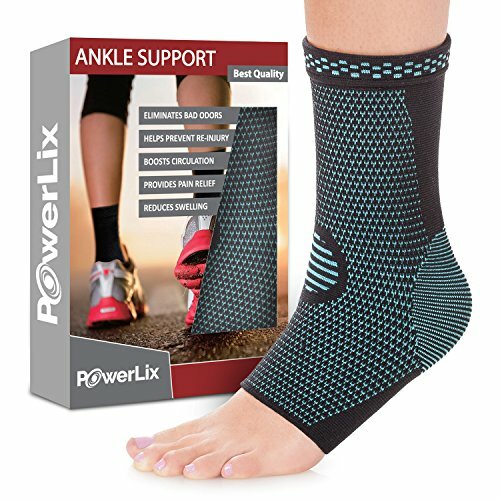 This ankle brace made by PowerLix is available in four sizes and it’s a sleeve-style brace for supporting the ankle following an injury. The sleeve also provides some graduated compression to improve blood circulation. The sleeve is made from breathable fabric to keep the ankle cool throughout the day. People who purchased this ankle brace said that it provided the support they needed following an ankle injury. Customers said that this ankle brace is soft against the skin and comfortable to wear for long periods. Customers were also impressed with the quality of the material used to make the ankle brace. Others who used this ankle brace said that the sleeve didn’t stay in place and it bunched up around their ankle. A few people said that although the ankle brace was fairly tight there wasn’t enough compression. Customers also commented that the fabric was thick and they couldn’t wear this ankle brace with their footwear. 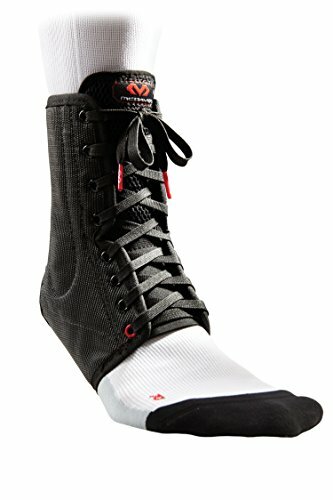 This lace-up ankle brace by McDavid is available in five sizes and it’s designed to support and protect the ankle. The ankle brace features spring steel stays to keep the ankle stabilized whilst allowing for some movement. The ankle brace is made from breathable polyester mesh to keep the ankle cool. Customers who used this ankle brace said the laces allowed them to adjust the brace easily and it’s very comfortable to wear. Customers also said that the brace supported their ankle well and helped to reduce swelling. People reported that the ankle brace is easy to keep clean by machine washing. Other customers who purchased this ankle brace said that the material is thick and abrasive and they developed blisters. A few people said they had difficulty putting the ankle brace on and taking it off. Customers also said that the quality of the stitching is poor and the seams on their ankle brace split after a few days. All of the ankle braces we reviewed provide a good level of support for the ankle after a break. We covered the three different types of ankle brace and all models are reasonably priced. All of the braces we’ve looked at are easy to put on, take off and adjust and they’re all well made. 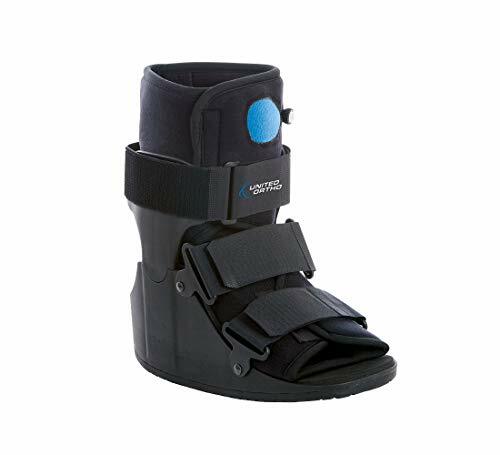 After carefully comparing the five products the best ankle brace after broken ankle is the United Surgical Short Air Cam Walker Fracture Boot. This boot-style ankle brace is supportive and protects the ankle due to the design and rigid construction. The lightweight boot allows wearers to walk around and the brace is easy to fit and adjust. We also liked the inflatable cushions which make the boot comfortable to wear throughout the day. 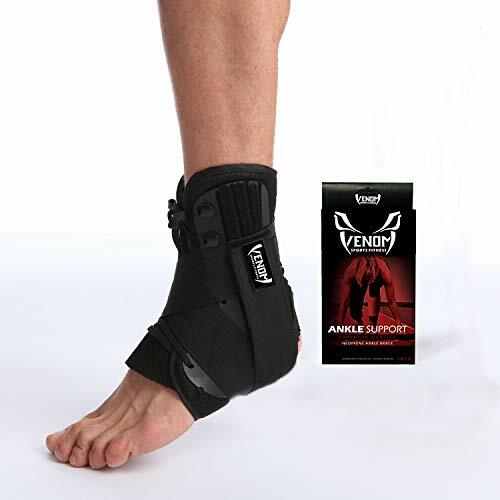 What is the Best Achilles Tendon Brace in 2019? What is the Best Compression Socks For Varicose Veins in 2019?